My large adult sons (actually they’re eight and six) and I bundled ourselves against the cold and worked for around two and a half hours this morning. We shoveled and salted while the snow fell. We’d gotten around ten inches of heavy, wet snowfall in the thickest places; the work was tiring and occasionally miserable; at one point the younger one broke into tears and accused me of treating them like slaves (he’s six), which occasioned a short and stern conversation. 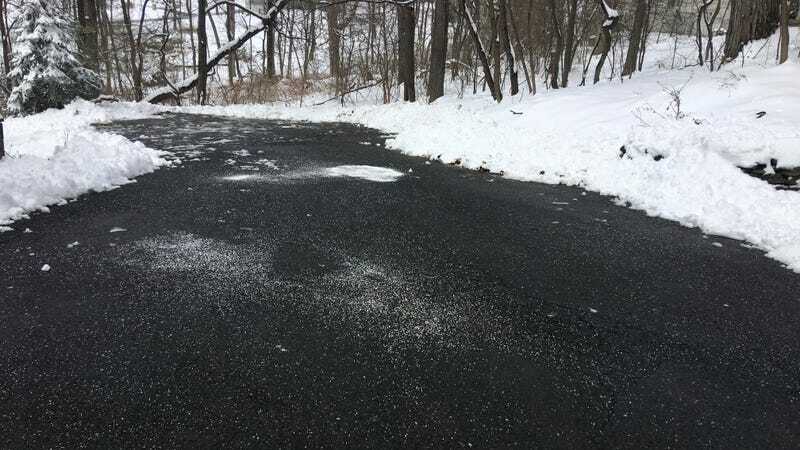 But there’s the result, up there: A mostly clear driveway, except for the place where the eight-year-old tipped over the salt spreader and dumped a bunch of salt right there in the middle of the driveway. My back is sore and half the day is gone, but, it looks good! Huzzah! And all it took was a little hard work and determination. Are you ready for the punchline of this joke? Here comes the punchline. The punchline is that thin black line cutting horizontally across the photo in the far distance. That line is the road. I’ll see you all in hell.